I hope you enjoy viewing my work! Working predominantly in Acrylics I tend to mix my palette as I work on the canvas. I paint contemporary land and seascapes, favouring dramatic skies. 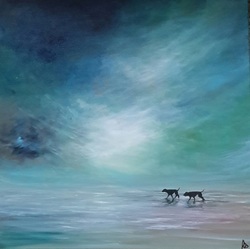 My work has been described as emotive and atmospheric with Scottish overtones. Although I was accepted for Dundee School of Art in 1981 I opted to take up a position in a large legal firm where I remained for many years. Later in life I attended part time classes at Glasgow School of Art and Strathclyde University in addition to specialist artists workshops and am still very much developing and experimenting with my style. I now work part time in the office and have more time to devote to my love of painting. I sell signed limited edition prints and am also working on a range of art cards from some of my images. My silhouette work can be personalised from your photos and I am happy to accept commissions incorporating images of you're choosing. ​My site is very much a work in progress.